Insightcentr is a SaaS solution that helps businesses understand workforce productivity by providing time-oriented reporting into web or desktop usage software. It provides analytics as to when, and to what extent, a workforce is using software, helping businesses to optimize software licensing costs and support process re-engineering efforts. Data can be anonymous and aggregated to ensure privacy is maintained. To connect to the Insightcentr content pack, simply choose Insightcentr Analytics from the list of available content packs. You will be asked to provide your Insightcentr company name and credentials. 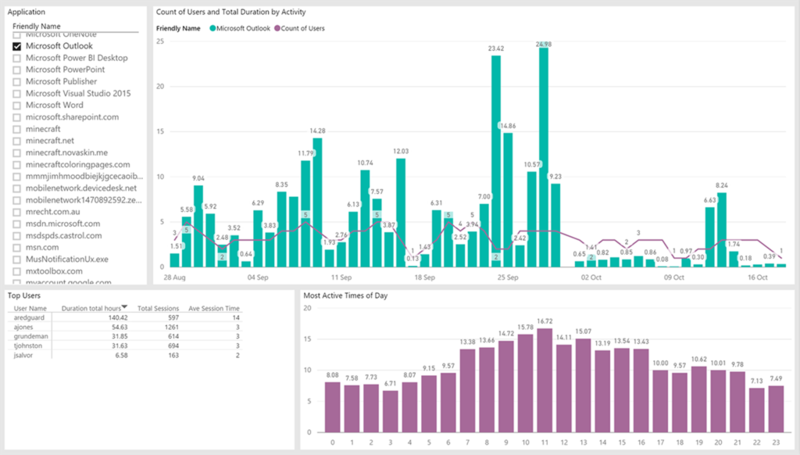 Once the connection has completed, Power BI will automatically create an out-of-the-box dashboard, report and dataset with data from your Insightcentr instance. The dashboard for the Insightcentr content pack gives you an overview of the data Insightcentr has captured, including a breakdown of organisational activity, average daily activity profile and information about the assets contributing to the dataset. 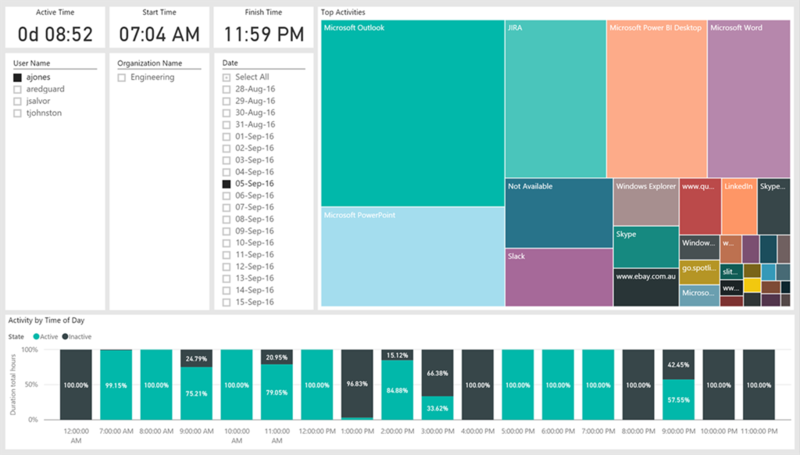 Clicking on any of the dashboard tiles will open the related Insightcentr content pack report, where you can interact and explore your data in greater detail. 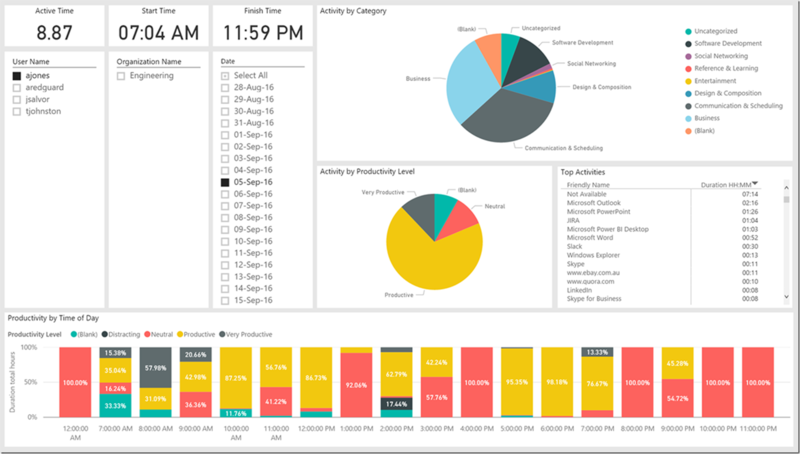 You can slice the data in the Activity and Productivity (shown below) reports by individual, team, or date range to understand how different activities are performed at different times of day. Power BI reports are interactive, so if you select a particular ‘Activity’ ,‘Category’, or ‘Time of Day’ the rest of the report page will update per the selection. The report has multiple pages through which you can navigate. 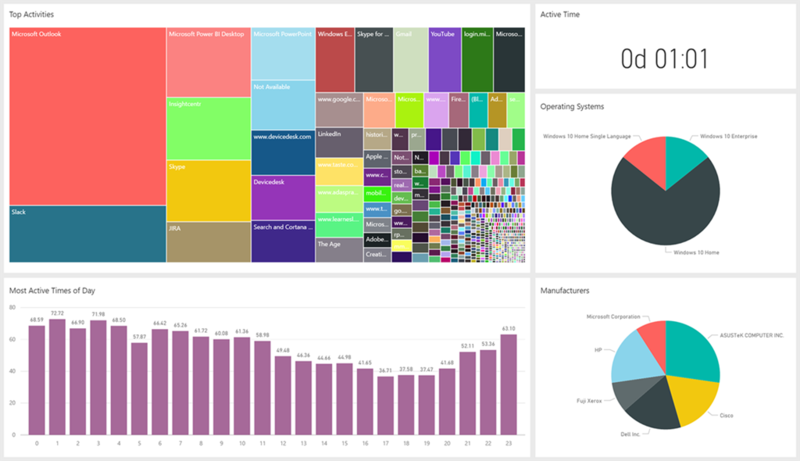 The Applications report lets you understand software or website usage over time. You can use this report to understand how many people are using which tools and how often, if adoption growing or waning, and to identify potential product champions. After the initial import, the dashboard and the reports continue to update daily, so you are always seeing up-to-date data. You can control the refresh schedule on the dataset and configure it to refresh at the exact times you choose. We’re always interested in hearing your feedback – please contact us at http://support.powerbi.com to let the team know how your experience was and if there’s anything we can do better.